When things get crazy in the middle of the week, having a few easy-to-prepare freezer meals can mean the difference between greasy drive-through food and having something healthy to eat for dinner. From dinner casseroles to breakfast items, here are 40 frugal freezer meals to get the ball rolling. Not only is it a great way to use up extra rice from curry night, but serving fried rice lets you use up other leftover food items creatively as well. It also keeps well, allowing you to make an extra large batch to freeze flat in quart-sized bags and take out to thaw once you’re home from work. You can go with the veggie and egg variety, or use this idea to deal with leftover chopped chicken, grilled pork or even bargain-priced salad shrimp if you’re trying to save on seafood. The next time you have some leftover rotini and spaghetti sauce, consider mixing them together with some shredded cheese and storing the whole thing in disposable aluminum baking pans in your freezer. The result is sort of a DIY pasta bake similar to the ones you can order for takeout from Pizza Hut or other similar Italian restaurant chains. Using leftovers creatively is one of the more powerful grocery saving strategies you can put into play. Whether you purchase frozen pizza dough or make your own to store ahead, pairing the dough balls with a variety of make-your-own pizza kits is a great way to make sure family movie night is a success. Prepare a variety of pizza sauces ahead of time, along with pre-portioned bags of shredded cheese and cooked ground beef or turkey pepperoni and you’ve got the beginnings of any easy meal you could even turn the teens loose on when one or both parents is running late at work. Making freezer stroganoff is an easy way to top off a baked potato or some egg noodles on a busy night. Use some mixed greens for an easy salad and you’re in business for dinner. Keep things even more affordable by purchasing the beef and mushrooms on sale and in bulk. Having your vegetables, protein and starch in a one-dish meal makes mealtime a snap. These Tater Tot casserole ideas are a great place to start, but there are other options such as tuna and noodles, chicken and rice and even cheesy ham and potato. Most broth-based soups freeze well and can be made in large batches to enjoy at the time of cooking while saving the leftovers to thaw later. Barley and mushroom works well, as do minestrone, red lentil and even vegetable beef. Since soups are so affordable, they are a great addition to your list of grocery saving strategies. Even if you don’t have time for homemade eggplant recipes, you can still purchase prepared breaded eggplant rounds in the frozen food section of the warehouse store and use them to create a vegetarian burger alternative topped with marinara and mozzarella. Purchasing frozen bread dough to roll out and stuff with a variety of ingredients makes a fun lunch or supper with or without a side of soup. This sausage and cheese bread is one example, but you can also do broccoli with cheese and turkey ham, or other pairings that suit your family’s preferred flavor palette. Whether you’re indulging in breakfast for dinner or simply planning a quick brunch before you head to the beach, making waffles ahead of time to freeze and pop in the toaster keeps things simple and tasty. Fans of Tex Mex food can enjoy it easily during the week with the addition of chicken enchiladas into your freezer meals repertoire. Whipping up a few batches ahead of time lets you haul them out a time or two per month to keep the fam fed on the fly. It’s no secret that international cuisines can be incredibly affordable for both at-home and restaurant dining. Curries are no exception, whether you are going with a traditional Thai version or a lentil-based Indian curry. Find some recipes that you enjoy and make them in large batches to freeze in meal-sized portions. Do the same with a large pot of rice, and you only need to thaw in advance for an easily microwaved serving. If assembling four batches of lasagna is too much effort, consider making stuffed shells that you can thaw individually to bake with marinara and serve with salad and pre-made bread sticks. The portion control is easier and you can prepare a bunch of them using fewer ingredients than it takes for lasagna. This is typically one of the first recipes people try when beginning their quest to serve more freezer meals. It’s easily scaled to however much room you have in your freezer, and the ingredients can also be mixed up to allow for whatever sales you happen to find. If you find yourself with a large bounty of sale russets, consider making a large batch of twice-baked potatoes for the freezer. They are a great way to perk up a meal of grilled pork chops and steamed broccoli and make entertaining last-minute company a snap. Even if you stock up on multi packs of prepared lasagna from Sam’s or Costco, you’ll still spend less than you would if you take the whole family out to dinner. Buying a bag of mixed greens certainly speeds up the salad-making process and keeping a decent boxed wine on hand rounds things out nicely. Preparing the ingredients for this ahead of time and then tossing into the slow cooker makes family sandwich night a breeze. Toss some raw veggies on the plate with a simple salad dressing dip and you’re good to go. Having bags of pre-cooked lentils or ground beef in the freezer makes a meal when you have a can of Manwich sauce in the pantry to go with it. Or, you could make your own sloppy Joe sauce to prepare a large batch to freeze. Just pop some toast or hamburger rolls in the toaster oven once everything’s heated through and you have a simple dinner. It’s up to you whether you pull this off with the crock pot or a saucepan. When chicken goes on sale, it’s always a challenge to come up with enough freezer meals to use up a large batch. A popular choice is chicken cacciatore which can be enjoyed over noodles, with rice or even with a piece or two of crusty bread. If you have an extra roast in the freezer and you want to feed a crowd, consider pulling one out and tossing it in the crock for the day with a little broth and onion soup mix so you can come home to some yummy French dip sandwiches. Paired with carrot sticks and enhanced with some sprouts, it’s a tasty meal that can feed a small crowd with a minimal amount of effort. You can either make a large batch of meatballs from scratch, or find an affordable prepared brand that you can thaw and heat with seasoned tomato sauce to serve with shredded cheese on a hoagie. Meatball subs are a hearty meal option that feels like takeout food, which helps keep you from feeling deprived when you are trying to save money on meals. Tortillas store well in the freezer, along with prepared taco fillings such as seasoned ground turkey, tempeh or hamburger. Having both items on hand means you can whip dinner up in a flash with only a few extras like chopped onions, sliced lettuce and diced tomatoes. Make a giant batch and freeze in small containers for a meal you can serve with corn muffins or potatoes. It’s hearty, affordable to prepare and can be left on its own if you don’t mind relying on a slow cooker. A good time to include these in your freezer meals is when green peppers go on sale at the grocery store. Making stuffed peppers does require a bit of time to get the ingredients ready, but fortunately you can make a bunch of them quickly once you get everything assembled. Bake them up with tomato sauce and serve with a batch of heated bread sticks for a healthy dinner that’s suitable for company. You can with whatever your favorite breakfast baked goods are for this idea. Pumpkin bran muffins? Knock yourself out. Cranberry – orange tea bread. Rock on. Basically, all of your favorites, from cinnamon rolls to rosemary scones are fair game. Meal muffins are a savory alternative to the morning versions and can be used at dinner time with simple soups like tomato bisque or a butternut squash puree. Simply put a few leftovers like chopped ham and asparagus into a basic batter and bake as usual for a well rounded grab-and-go dinner you enjoy with a mug of steamy stew or soup. If you’re looking to use meat as more of a flavoring or condiment, then red beans and rice is an excellent recipe to start with. Since it also stores well on ice, it’s a great addition to any list of freezer meals. If you have some Stove Top Stuffing in the pantry, then you can easily pull dinner out of the freezer if you have some frozen broccoli and a batch of stuffed pork chops. This menu pairs well with spiced iced tea, sangria or even lemon water. As with lasagna, even if you go with the prepared version of veggie or chicken pot pies, they still provide affordable freezer meals that come out costing less than a night of drive-through value meals. Even if you don’t have the energy to whip up a salad, a certain number of veggies are included with the dish, making it a meal you can feel good about serving. These are an easy item to bake ahead to freeze, and can be even more affordable if you prepare your own corn bread mix to use. Simply slice your favorite brand of hot dog into small chunks and stuff into the center of the batter before topping with an extra dollop and baking. Freeze extra for an easy meal. Having a few saucy potato topping options like a broccoli and cheese sauce mix, pre-cooked bacon crumbles and even mushrooms in gravy can be easy to heat through and toss on top of a baked potato from the oven. Leftover rice and frozen pepper mix along with pre-cooked black or pinto beans combine when thawed to create a simple knock off to the vegetarian burrito bowls served at Chipotle Grill. Toss a little thawed guacamole and hot sauce into the mix to take things to the next level. Using the frozen chili suggestion from above, along with some frozen veggie dogs and hot dog buns, you can have a yummy solution to dinner in the form of toasted chili dogs. Enjoy them with a cold beer if it’s been a particularly rough day. Making baked beans in advance to freeze with biscuit dough means you can have a quick dinner at the end of the day, provided you remember to take them out to thaw before work. The cool thing about freezer quiche is that you can serve it for breakfast, brunch, lunch or even dinner, depending on what you choose for side dish pairings. Freezing prepared pancakes means you can have a quick morning meal or even an evening snack if you want to microwave one along with a couple of sausage links for an easy wrap. Since they are prepared with the more affordable staple foods such as flour and milk, pancakes are particularly inexpensive. For a real grab and go breakfast option, try making breakfast cookies out of oatmeal, bananas and a few other minor ingredients. They are a low-fat meal that doesn’t require you to dirty any dishes in the morning. For those who want workout food to be a large part of their meal plan, energy balls are a fun item to incorporate into your list of favored freezer meals. They don’t take up much space when you store them, and a little goes a long way with these things making them a great ROI for the time spent. A squirt or two of fat-free Italian dressing in a freezer bag with a chicken breast means you can thaw one out in the fridge while you’re working for the day and toss it on the Foreman grill when you get home to enjoy with steamed greens. Easy peasy. If you get a great deal on ground meat, season it with your favorite spices and form into patties that you can freeze separately. That way, if the family wants a quick barbecue on the back porch some night, you’ll be fully prepared. 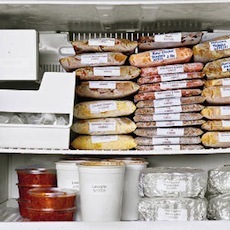 Freezer meals may not be the answer for every night of the week, but they are certainly have their place for helping families, couples and singles alike with their meal planning efforts. It is great to know that I have a lot of choices. I make it habit to store different set of meals each week. Our freezer is not that big and a week preparation has always worked fine with me. You mentioned spaghetti sauce – but even better is spaghetti. Gotta make twice as much spaghetti and sauce every time, mix, and freeze half. Everyone knows the leftovers/freezer batch tastes better than the original!